Better musical performance. This is good if you are actually a professional musician but you will surely love having a better musical performance even if you are playing the piano simply for self amusement. Extend the life of your digital piano. You can get around with the wear and tear damage your piano acquires over a long period of time by replacing certain parts every now and then. Better pricing for your digital piano. Are you selling your piano? You can raise the selling price of your piano by replacing some parts that can help give your piano a better musical appeal. Better visual appeal. 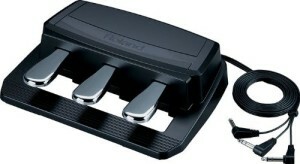 If you want to give your digital piano a more stylish look then you can start by getting a new set of pedals. More comfort when playing the piano. Having a new set of pedals for your digital piano can make playing more enjoyable. If you want more satisfaction for your playing, then having a new set of piano pedals should be one of the things you should keep in mind. Know what you want and need. To get the most out of your money, you should make sure that the piano pedals you buy meet your personal preferences. Are you getting a new set of pedals because you want a better playing experience? Or are you simply replacing your piano pedals for the sake of replacing them without any regard for quality? Simple knowing what you want can help you determine the right set of piano pedals for you. You should consider purchasing piano pedals online. In some cases, you may find that the piano pedals you are looking for are not available in your local store so your best option is to purchase them online. Also, purchasing online is more convenient since you won’t have to get out of the house to buy something. All you need is your credit card. After you have placed your order, the product will be delivered at your doorstep right away. Be sure to get your piano pedals from a reputable seller. The easiest way to get a high quality set of piano pedals is to simply get them from stores with good reputation. A well-established and reputable seller can give you brand recommendations and product warranties to make sure you get more than your money’s worth. In this video below you can hear what each piano pedal does. The functions and effects of the pedals are shown on a Baldwin grand piano, but it’s the same on digital pianos.